Sunday marks the beginning of spring at last, then the election next week, and then we go into a spin as properties will no doubt flood the market. Also so much hype and plenty of "spin" on how fired up the market is becoming. But that's ok, as agents, we are used to living the real estate spin. The reality? Yes, there is sure to be a lift in spirits and confidence given a decisive election result next week—for all property owners, let's hope it's decisive! The weather is coming good after such a cold wet winter and there may be another interest rate drop on Melbourne Cup Day, according to those in the know. It all feels good. The reality is that YES, Sydney is reporting all time record auction clearance rates over 80%. YES, Adelaide had a great week with an auction clearance rate of 70.7% last week, and YES, Chinese buyers are active—buying up lots of property—but Adelaide is only sitting on the fringe of all this activity. Our local buyers remain by far and away the most significant players in the market, while interstate and overseas buyers come and go in waves. I've had personal briefs from both Australian Property Monitors (APM) and RP Data in the past weeks as to the state of SA market. They both show Adelaide as a stable and very consistentresidential market, with little change expected for at least the next two years. Their conclusions factor in the recent surge in activity in Perth and Sydney, and the expected knock on effect it potentially has. Our home values went up just 1.1% over the last 12 months to July 2013, compared to Perth at 8.3% and Sydney at 7.5%. Increasing unemployment and our local economy do worry both analysts, but it still looks ok for property. Investor activity has gone through the roof as property has emerged again as the flavour of the season. Improved buying power, lower funding costs and solid rents make property look really attractive once again. Yeah—we're getting popular again. I read with a smile all the spin about the Chinese buyers flooding across our borders and buying up big—and while the nub of these stories is true, the reality is that this is a global phenomenon. The people buying property in Adelaide are pretty much all known to Adelaide with connections here. The Chinese market are astute and don't just throw darts at the map with cheques attached. As we pointed out months ago in this column; Australia now operates in a Global market place and as local Agents we need to act in the best interests of our clients. We need to be sure we are all over any emerging trends and market changes. 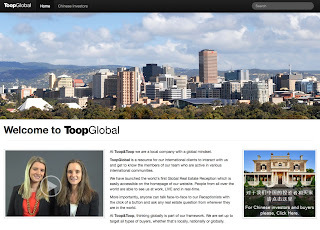 Launching our ToopGlobal website this year ensured we had a place for people from around the globe to connect with us. Part of our strategy was having a fully translated Chinese website for our clients, a precautionary move to ensure we cover all bases, while creating a way to measure and track where enquiry was actually coming from. The Chinese juwai.com site—having received so much publicity recently—is a place for global property owners prepared for a scatter gun approach to selling (and with money to burn) to place their "needles into the global property haystack!" Check it out—the site stats say it all. Their real action is in the USA and Europe property sales, and in Australian markets, primarily Sydney and Melbourne developments. Local connections and local trusted networks are driving the best sales results for local, national and international buyers; there's no doubt about it. Back home, spring is finally here and it's an awesome time to sell. We have buyers from all over the place hungry to hear about new stock, so it's time to cash in—we're ready to take your call.